If you are living in the US, you should be having a proper home heating system to manage those chilly winters. Most of the American households depend on furnaces for the same. Furnaces are used mostly for the central heating systems – which work by blowing heated air through ducts, that use grills or air registers to deliver warm air, throughout the house. This duct based heat distribution system is powered mostly by natural gas, fuel oil or electricity. 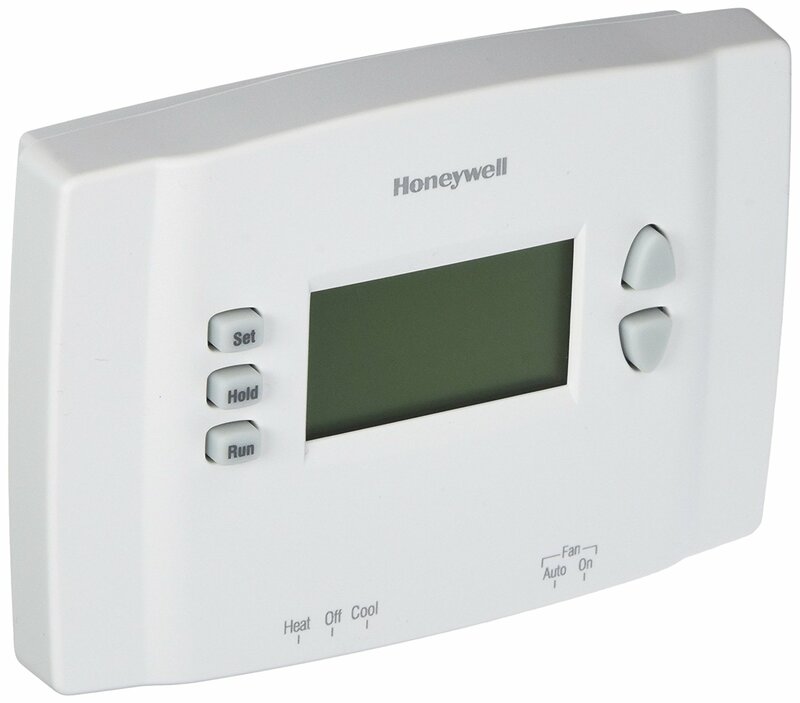 In this guide, we write about thermostats for furnace based heating/cooling systems. We help you choose the right furnace thermostat – that could save you energy and provide the best comfort. In terms of AFUE(annual fuel utilization efficiency), the furnace powered by electricity has a higher efficiency in the range of 95% to 100%, since it is free of fuel loss through a chimney (which is common in furnaces powered by gas or fuel oil). However, with growing electric prices across different parts of the country, the choice of an electric furnace seems uneconomical. Around 90% of homes in America uses a central furnace or a boiler or a heat pump based system as their HVAC (heating/cooling) system. Nonetheless, the energy consumed by these furnaces can be saved by controlling the furnace operation, using a proper thermostat. Thermostats are nothing but temperature sensing devices that maintain the room temperature at a set point by controlling the heating/cooling (HVAC) system. When it comes to choosing a furnace thermostat, you have numerous options, which may leave you confused. Let’s first see some important points you must know before choosing a thermostat for your furnace. Before moving forward, we’ve listed out the best furnace thermostat choices in the table below, just in case you need a quick nutshell review. How to choose the right furnace thermostat ? The first and foremost thing you must do is to check what kind of heating system you are using at your home. Basically heating furnaces are of two types: one, which is common is the single stage heating system and the other one is multi stage heating system. How to know which one you have at your home? If you have a single stage heating, it means you have a furnace that has only one level of output. A multi stage heating system has a primary heating system like a furnace and a secondary heating system like a heat pump which acts as an emergency heat setting system. Also, if your house is an older construction, you are likely to use baseboard heaters or heating systems that work at line voltage of 120V or 220V. In such cases, you need a line voltage thermostat for your heating system. Works with Single stage heat or cool: This label indicates that the thermostat can be used if you have a single stage heating and cooling system. Works with 2 Stage or multi-stage heat or cool: This means that the thermostat can be used if you have a multi-stage heating or cooling system. Energy Source Compatibility – Central furnaces are usually powered by Natural gas, Electricity or Fuel oil. You’ve to check if the thermostat supports all these fuel types or not. Usually all modern thermostat models supports all the commonly used fuel sources, say Natural gas ( to be used as a gas furnace thermostat), fuel oil or electricity. Zoned HVAC: If your Heating and/or cooling is individually controlled in different areas by the same HVAC system, then the thermostat with this label is to be used. You’ve a handful of options from Smart thermostats, WiFi thermostats, Programmable thermostats to the Digital non-programmable model to choose from as a furnace thermostat. Well, smart furnace thermostats (like Nest or Ecobee) come packed with a lot of features like self learning and they save high on energy bills. But those “smart features” comes with a price tag as well. 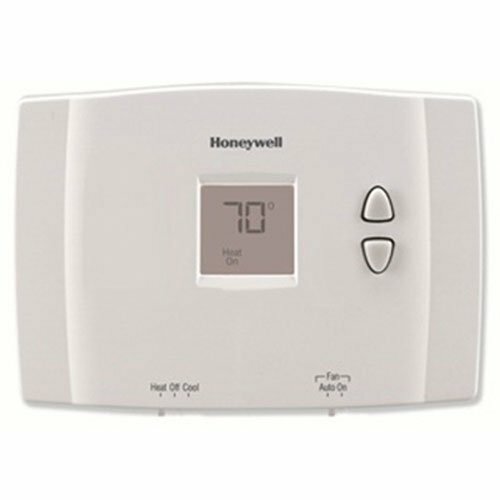 If you don’t have that high budget for smart variant, you can go for the next best option – a wireless/WiFi furnace thermostat ( like Emerson Sensi or Honeywell RTH9585WF ) – which facilitates WiFi based control over internet. The third best choice is a normal, digital programmable furnace thermostat – which serves all the basic essentials of a thermostat within an affordable budget. In this article, we’ve carefully handpicked different models to guide you in choosing the best thermostat for your furnace. The smart thermostats are the buzz these days, and if you have a good budget – “a smart model” the best option to go for. They are programmable, self learning thermostats – which can learn from your habits and automatically programs the schedule according to your lifestyle patterns. They are the most energy efficient thermostats available – and they save energy like no other thermostats. All smart thermostat models have WiFi connectivity and they can be controlled from anywhere in the world using mobile apps (via internet). Let’s see the best of smart furnace thermostats and what all “smart features” they bring to your home. Nest has two thermostat models – Nest 3rd Gen and Nest E (read our full review of Nest Thermostats) – both of which are ideal to use as a smart furnace thermostat. Out of these two, Nest 3rd Gen – is the full featured model, which has all the features of a smart thermostat. Nest 3rd Gen also has higher compatibility with different types of HVAC systems. When it comes to central furnace based systems, Nest 3rd Gen is compatible upto 2H/3C (2 stages of heating and 3 stages of cooling). Nest E is the budget model – which is basically a trimmed down version of the Nest 3rd Gen model. Nest 3rd Gen – the full featured model has higher compatibility and it supports many multi stage furnace systems. When it comes to central furnaces, Nest 3rd Gen supports the following stages of heating/cooling configuration – 1H/1C, 1H/2C, 2H/1C, 2H/2C and 2H/3C. 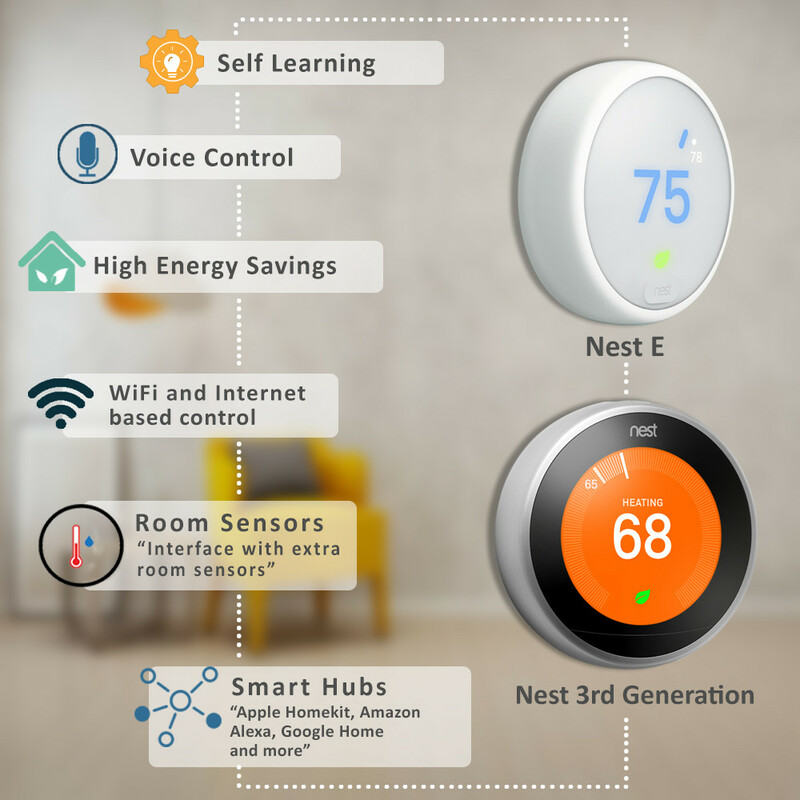 The budget model Nest E supports only 3 types of configurations – 1H/1C, 1H/2C and 2H/1C. Apart from this, Nest 3rd Gen supports accessories like humidifier, ventilator and dehumidifier, whereas Nest E has no support for any accessories. They both (Nest E and Nest 3rd Gen) supports Natural Gas (can be used as gas furnace thermostat), Electricity and Oil as fuel type in central furnace based systems. Both Nest models (Nest E and Nest 3rd Gen) are smart thermostats with lots of smart features like self learning, WiFi connectivity & mobile app based control, high energy savings (Nest claims upto 15% energy savings on annual energy bills), voice control, smart home hub integrations (goes well with Google Home, Apple Homekit, Amazon Alexa), option to interface extra room sensors (to manage any hot/cold spots in your home) and many other useful features. The prime difference between Nest 3rd Gen and Nest E is in compatibility (as you already know, Nest 3rd Gen is compatible with more systems), build quality and a feature called “far sight” – which is available only in Nest 3rd Gen.
Read our full review of Nest 3rd Gen vs Nest E and compare the two models. This smart thermostat comes with an in-built voice service feature, so all you have to do is ask your thermostat to set a timer that suits you. Additionally, it will read you the news, turn the lights on/off and adjust the temperature whenever you ask for it. It is powered with far-field technology, that means you can ask for the services you need from the thermostat from across the room too. It claims to save up to 23% on heating and cooling since it can work with your local weather conditions in real time when connected to internet. You can check and control the temperature of the thermostat from anywhere using application in your android devices. Installation is fast and easy as it gives a step by step guide to install in your phone. Both Ecobee models supports all the 3 commonly used fuel types, say Natural gas, Electricity or Fuel oil. 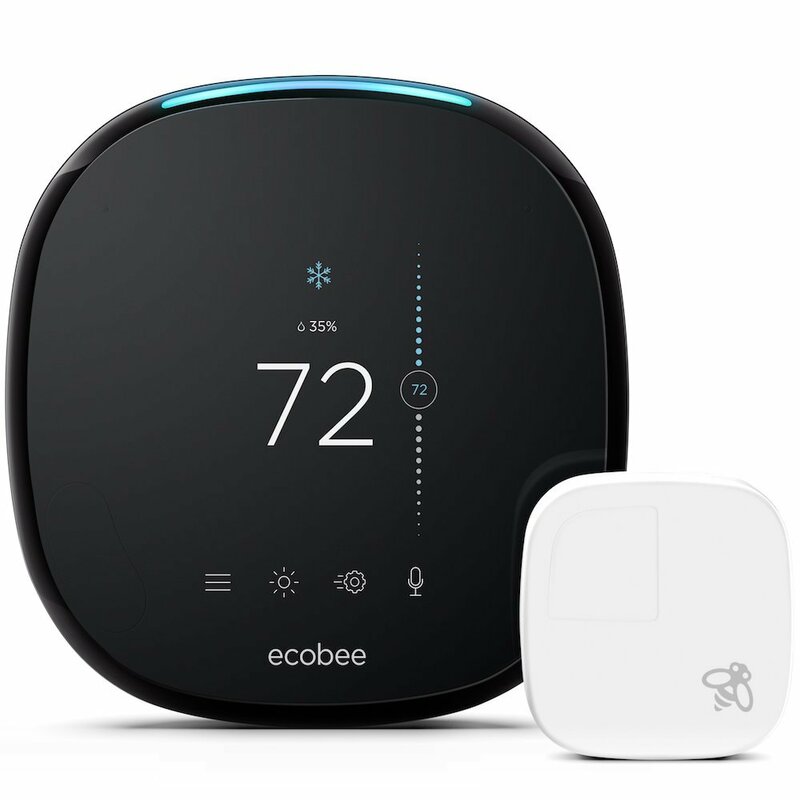 Ecobee 4 and Ecobee 3 Lite – both can be used as a gas furnace thermostat. Wi-Fi enabled furnace thermostats are becoming the standard equipment at homes now. They use your home Wi-Fi connection and let you remotely check and control the temperature settings. This eases the pain of programming the thermostat every time. All you need is to enter the temperature and set the timer, in the application downloaded on your mobile. The thermostat will program the schedule on its own. We’ve a dedicated guide featuring various WiFi thermostats suitable for different types of HVAC systems. Go through our guide, if you’re looking specifically for a WiFi enabled furnace thermostat. Here we have listed out a few Wi-Fi thermostats with a brief review of each. 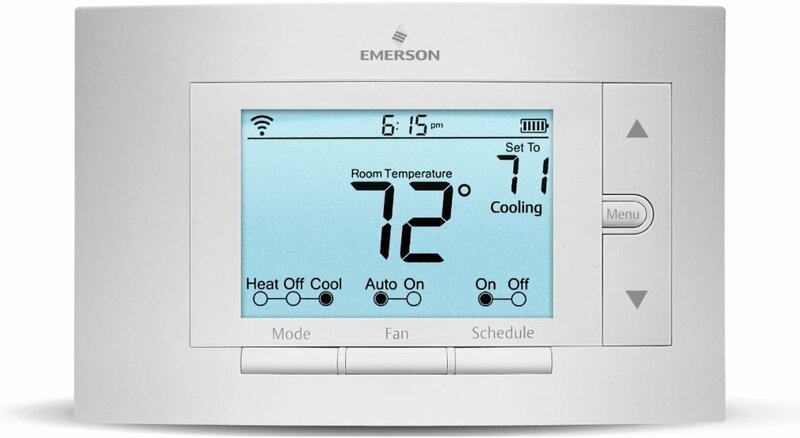 The Emerson sensi Wi-Fi works like a traditional thermostat which makes it convenient to use. It is a 7 day programmable thermostat that feature geo fencing for location based temperature setting. It comes with 2 AA battery needed for its operation. It addresses the issue of wide temperature swing which most of the smart thermostats have by introducing a feature called the “cycle rate setting”. Once you have downloaded the application on your phone, it will walk you through the installation process step-by-step. Compared to other smart thermostats, it is cheaper yet reliable, programmable and easily understandable. 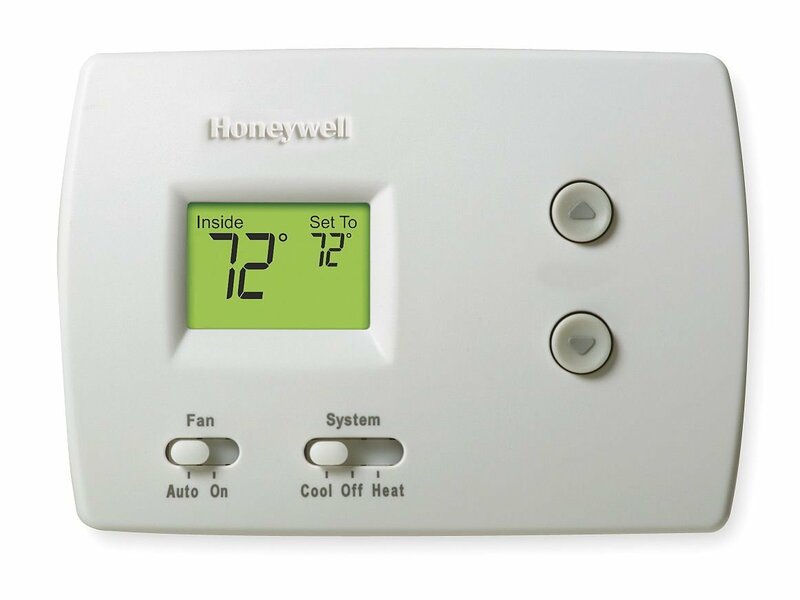 This thermostat model from honey well’s connects your HVAC system to the rest of your home’s Wi-Fi connection. Unlike other thermostats, this one needs a C or common (return) wire to work. Also, it needs to be powered from 24V ac. In case of power outage, the thermostat will resume where it let off after the power resumes. The coolest feature it has is that it comes with in-built voice recognition system that will lower or raise the temperature whenever it is asked to do so. Also you can remotely access to control and monitor the temperature through the application on your device. 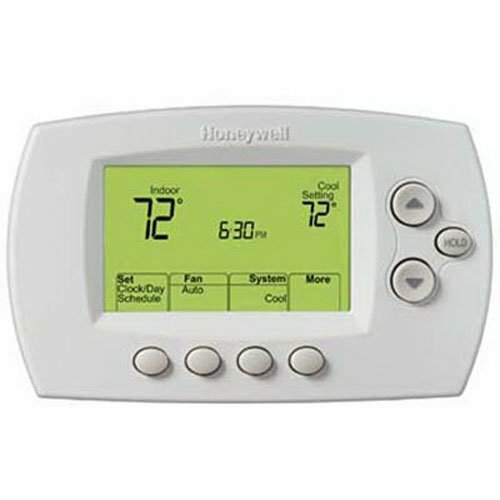 The Honeywell RCHT8610WF2006 lyric T6 thermostat blends easily with your lifestyle and adapt to it to schedule programs for you. If you don’t want that, you can always program your schedule yourself also. Lyric app is compatible with both android and iOS devices and helps in remotely controlling the temperature and timings. What makes this model unique is that it uses the geo fencing technology that tracks your location, and turns on whenever it senses that you are coming back home. You can use your phone to trigger this feature based on your arrival departure. When it senses that you are not at home, it will switch to “away” mode automatically. 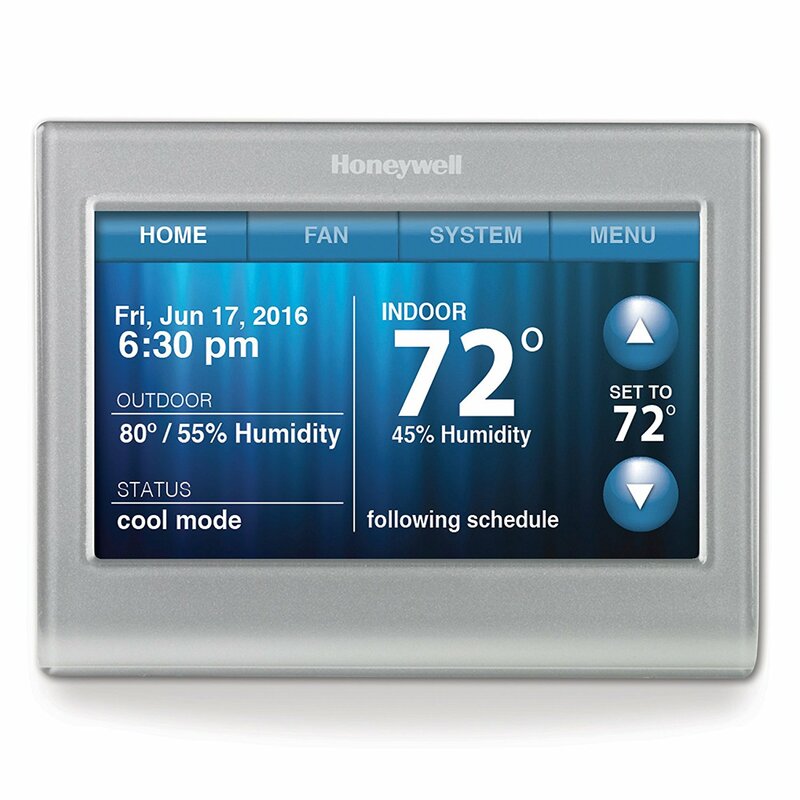 Honeywell RTH9580W smart thermostat offers you flexibility in scheduling the temperature settings. If you want the thermostat to be set up at home or business place, you just have to program accordingly. With an easy to read customizable colour touch-screen, this thermostat is quite convenient to use. It is compatible with 110V or higher heating systems with a common wire. It connects to your WIFI connection so that you can remotely access and control the temperature settings from literally anywhere. 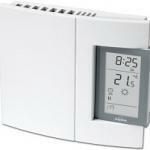 Unlike some other thermostats where you need to turn the dial to change the settings or schedule, this thermostat has touch screen tabs at the top of the screen that help in navigating through the settings and schedules. The digital programmable thermostats are the ones that let you program the schedules according to your convenience. However, they wont adapt to your habits like smart thermostats. They come with in built schedule program, which can be used also. Here are some of our picks in this category. 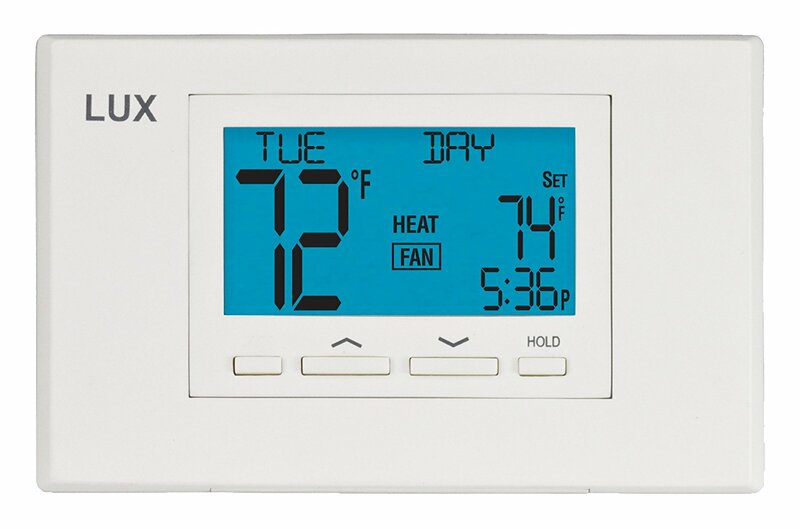 LUX TX9100U thermostat comes with a 7 day programmable memory and blends in easily with your home. Its large lighted one touch display makes it easy to use. Instruction sheets are provided which help while programming the thermostat. You can use it even if you have a multi stage furnace. One of the unique features of the thermostat is its smart recovery that enables it to reach the set temperature at a specified programmed time. It has vacation hold option, that shuts off the thermostat for a maximum of 30 days. This energy saving thermostat is a low voltage thermostat. IT has soft touch button surface with large backlit display, making it convenient to use. It provides precise control over the temperature, and is compatibile with both heating and cooling systems. It comes with a programmable memory that lets you program your schedule, according to your wish. Installation is easy as it comes with an instruction manual for the same. 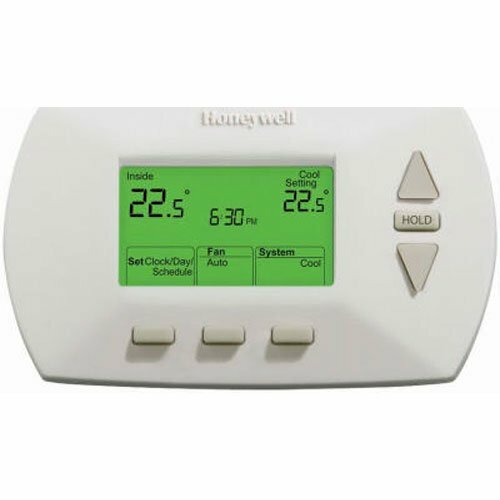 If you are looking for a thermostat that is very basic yet digital, this is ideal for you. It is easy on pocket and very easy to use. They cannot be programmed and hence are not as energy efficient as the other programmable thermostats. You can set a temperature and it will cool down or heat your room accordingly. This non programmable digital thermostat provides a very simple control over the temperature. All you have to do is select a temperature that you want your room temperature to be and adjust it whenever you wish to change it using the up/down buttons. This thermostat is compatible with all single stage heating system but it does not work with electric baseboard furnaces. It is slim and has compact design. This thermostat from Honeywell leaves you out of the pain of programming the schedules. Just select one temperature that you desire and you are good to go. A large backlit display is provided which is easy to read. It is cheap and worth the money. It has a precise control over the temperature of +/-1 degree Fahrenheit for constant comfort. It has slide switches which lets you choose the heat or cool mode. It requires 2AA batteries for battery back up in case power outages. We have discussed some of the thermostats here to give you a general idea of what to look for your furnace. If you are looking for an energy efficient thermostat, then as already discussed investing in a smart thermostat, will save you on your energy bills in the long run. However, if you want an energy efficient thermostat but also not ready to invest high buck then going for a simple programmable thermostat would be a good option. Non-programmable thermostats are easy on pocket and also the easiest to use. Its upto you to decide which one suits your needs the best. 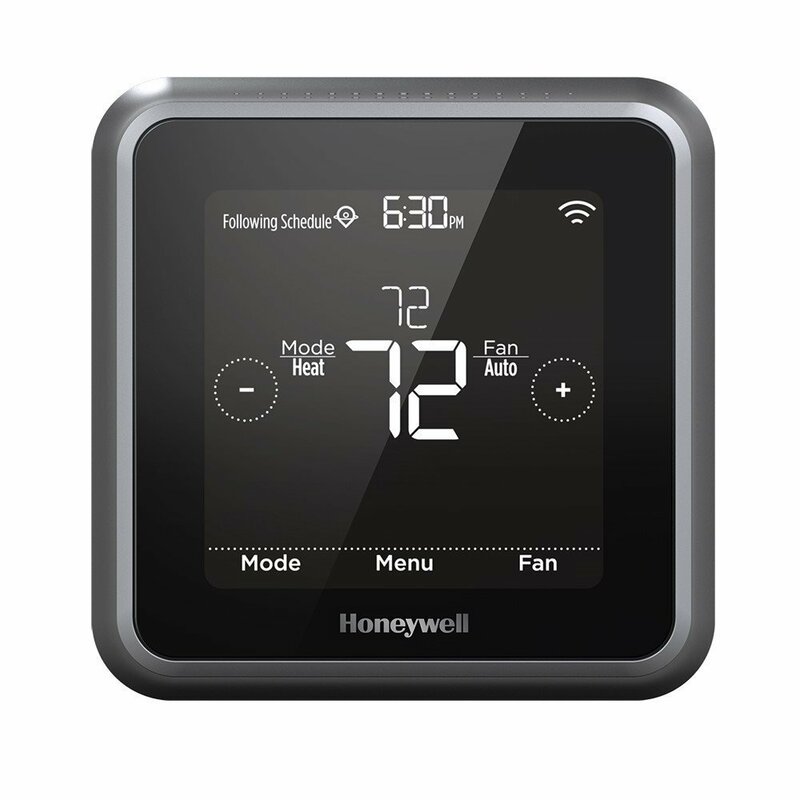 I bought a Honeywell non-programmable thermostat for heat and cool It failed within two weeks.Home depot will not replace it.Instead I must deal with Honeywell.It is a digital model.What a bummer!!! @Donald, that was an unfortunate experience. I hope Honeywell replaces it quickly.